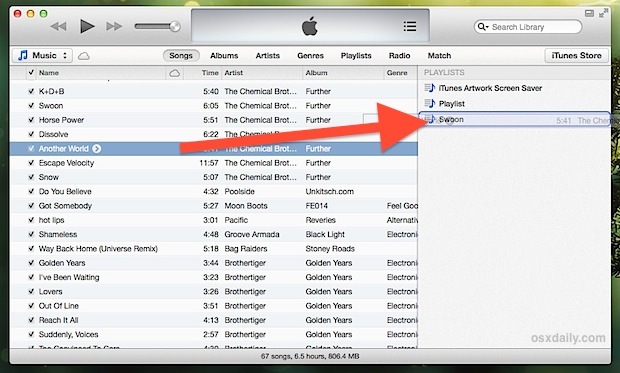 If you upgraded to iTunes 11 you know the default view removed the sidebar with its playlist view. Sure it’s easy to show again, but if you’d rather keep with the new simplified user interface, don’t miss this simple trick to make a new playlist or add songs to a playlist, without using the standard sidebar ever again. These playlists can be found and edited further by clicking the “Playlists” tab as usual, and can be added to at any point by just clicking and holding anything else in the iTunes library. With this new feature, you can keep the iTunes interface simplified as the default setting suggests, and it actually starts to make more sense since the action of creating and editing playlists is hidden unless it’s needed. Thanks for the tip idea Addy! If you upgraded to iTunes 11 you know the default view removed the sidebar with it’s playlist view. You’re much better at catching these typos than I am, thanks! Or just enable the sidebar and drag and drop like you used to. Or if there’s no empty space in that sidebar, you can just drag-and-drop your song(s) onto the “PLAYLISTS” header in order to make a new playlist. Click and hold, then drag to the right, speeds up the process no end!